Blue light fluoroscopy marked poker cards is produced with imported equipment, offering you a most clear, bright and beautiful perspective effect. Blue fluoroscopy marked poker cards can be marked with small fonts on four corner, so it will be more concealment, and it can be seen through by the blue light invisible ink contact lens and Blue light camera. 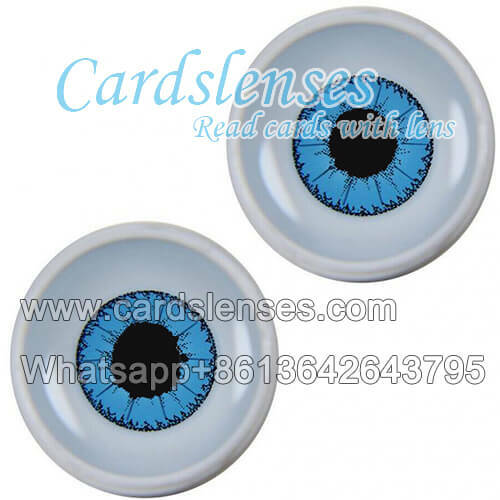 Blue light invisible ink marked poker cards and contact lens can give you a clear effect, it can be used in the Texas Holdem, Omaha4 cards, Omaha5 cards and other games. You only need to wear our blue light one on one contact lens, and then use our blue light one on one marked deck poker, and you can clearly know that others' hands. And this method is very hidden. This marked poker is without any flaws, no one can find any problem. If you need, you also can send your cards to us, and we can process it to be blue light marked cards.